Complex Regional Pain Syndrome, CRPS, is a very misunderstood and under-diagnosed neurological condition which causes debilitating pain. Doctors often search for answers through multiple medications and procedures while patients search for relief. Having suffered with CRPS for about 13 years before my amputation, I can promise you that it is not a condition that is to be taken likely. It affects your energy, mood and often leaves people in such a confusion and distressful situation. CRPS has no known cause however it often starts as a result of an initial injury. The injury itself can be as minor as a sprained wrist or broken toe but the resulting effects are terrible. The condition was initially thought of as a psychosomatic condition (in the head) however it is now apparent that this is not the case. CRPS causes the initial injury to spread and often affect larger areas of your body. For instance, if you broke a finger, CRPS would often spread to the whole hand or arm after time, with a potential to spread to the other limbs. Doctors believe that my CRPS was caused due to some surgeries that I had on my foot, as a result of severe plantar fasciitis. They say that CRPS could be an abnormality in the central nervous or immune system or the blood vessels. 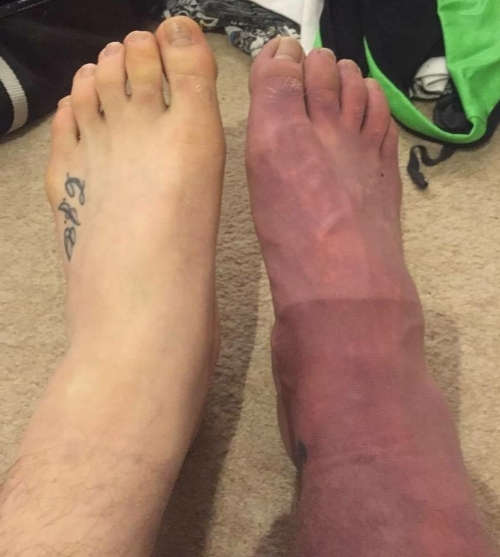 As CRPS also affects how well you detect pain, your swelling and the control of temperature and movement, the affect limb(s) are often very red/purple and swollen. 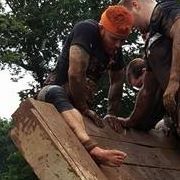 One quote from an individual said that they felt that "on a good day my ankle feels like it's being strangled by hot cheese wire. On a bad day the cheese wire is electrified." I was unable to move my foot (when I had it) and most of the time it was very discoloured. I wasn't able to wear any shoes or socks due to the pain and any wind or rain on my foot would send electric-type shocks through my foot and into my spinal chord. My foot would constantly feel like it was on fire and as though it was sitting on embers as the atmospheric pressure changed - flights were certainly interesting. CRPS is often diagnosed after years of trying other condition diagnoses. The diagnosis will often happen in a specialist pain clinic after multiple tests. Unfortunately, CRPS isn't diagnosable after a simple blood test or X-Ray so it is often seen as the last resort and many medical practitioners aren't aware of the condition. After developing chronic pain at the age of 9, my CRPS wasn't diagnosed until I was about 20 years old! Unfortunately, this isn't an easy question to answer. While doctors are searching, no cure has yet been found - probably because they still don't know what causes it! Studies show that if you are younger, you are more likely to have a better outcome and similarly, with early intervention, the possibility of being able to live a 'normal' life is increased. Often when treating CRPS, a multi-disciplinary team will be involved and will often include physiotherapists, psychotherapists and occupational therapists. Physiotherapists are often keen for the affected limb to be mobilised as much as possible. This will improve blood flow and subsequently reduce the circulatory problems. It would also increase the flexibility, strength and function in the affected limb. Occupational therapists can also be used to help teach the techniques to work with the affected limb, in order to perform everyday tasks. Psychotherapists can help the individual come to terms with CRPS as it is an extremely difficult and debilitating condition to live with. It is very common for people with CRPS to develop anxiety or depression, which continues to deteriorate as their condition worsens. Psychotherapy can help individuals maintain a positive attitude, which is essential to recovery. Medications and medication trials are at the forefront of initial 'curing.' Although there is no 'one pill' to help with CRPS, a combination of medications are often prescribed and trialed over years. Studies have showed that medications initially used to treat depression are shown to be effective for CRPS. High level painkillers and infusions can also help to alleviate the pain, such as morphine, fentanyl and ketamine. When I was searching for some pain relief, I tried a huge variety of medications, each of them having their own side effects. Spinal chord stimulation is often offered to people with CRPS. This procedure can relieve pain through a needle being inserted into the spinal chord. Electrodes provide a tingling sensation in the affected area and the implementation of the device is done over months. The device is implanted into the skin and it can be controlled through an external controller - you certainly wouldn't want to loose that remote! Nerve blocks, either through an injection in the spine or surgery can also help to alleviate some pain however experts are divided with this. Some believe that it can cause pain relief while others believe that it can actually make CRPS worse. I have had both types of nerve blocks, which neither of them offered permanent pain relief. Amputation is also a potential cure for CRPS however there is no evidence (yet) to prove that this is the case. Although some individuals are able to battle their CRPS with an amputation of the affected limb, such as myself, it can also move to the stump and spread to other areas of the body once the limb has been removed. People with CRPS are often told that amputation will 110% not remove the pain and doctors are reluctant to be told otherwise. It took me 6 years to fight to have my leg amputated and it was the best decision I have ever made. Having said that, there was always that risk that it wouldn't work. Speak to your specialist if you are seriously considering amputation as an option. What's the future for CRPS? I would have loved to paint you a lovely picture, where CRPS is a great condition to have that goes away with the push of the button. The reality though, as you can imagine, is that it is not quite anywhere near that. CRPS UK is a patient-led organisation which seeks to help suffers and educate society. Through their work, the knowledge of CRPS within medical professionals will be more well-known and the search for a cure can be broadened, as well as offer a quicker diagnosis for individuals to ensure a good quality of life and treatment. Although I did not have the quality of life that I have now, post amputation, it is still possible to live a 'normal' life with CRPS. It's about knowing your triggers and how you are able to manage your condition. There is a great Facebook group for support if you are suffering with CRPS, and it can be found here.